The Worldwide Reference System (WRS) is a global notation system for Landsat data. It enables a user to inquire about satellite imagery over any portion of the world by specifying a nominal scene center designated by PATH and ROW numbers. The WRS has proven valuable for the cataloging, referencing, and day-to-day use of imagery transmitted from the Landsat sensors. The Landsat 1-3 WRS-1 notation assigns sequential path numbers from east to west to 251 nominal satellite orbital tracks, starting with number 001 for the first track which crosses the equator at 65.48 degrees west longitude. A specific orbital track can vary due to drift and other factors; thus, a path line is only approximate. The orbit is periodically adjusted after a specified amount of drift has occurred in order to bring the satellite back to an orbit that is nearly coincident with the initial orbit. Row refers to the latitudinal center line of a frame of imagery. As the satellite moves along its path, the observatory instruments are continuously scanning the terrain below. The instrument signals are transmitted to Earth and correlated with telemetry ephemeris data to form individual framed images. During this process, the continuous data are segmented into individual frames of data known as scenes. Landsats 1-3 scene centers are chosen at approximately 25-second increments of spacecraft time in either direction from the equator with each scene equal to approximately 163 km (101 miles) on the Earth’s surface plus about 10 percent in-track overlap (5 percent for Landsat 3) added by the ground processor. A total of 119 Landsats 1-3 daylight scenes are possible along one descending satellite path. A complete orbit of 6196 seconds, when divided by 25 seconds, yields 247.84 intervals; 248 scenes per complete orbit (descending and ascending) were selected as the standard. The framing is uniform for each orbit. The adjacent east-west scenes have scene center locations at the same nominal latitude. A notation of Row numbers can, therefore, be applied to identify all scenes occurring at the same latitude. Row 060 corresponds to latitude 0 (equator). Row 059 is immediately north of this, and the progression continues to latitude 80 degrees, 1 minute and 12 seconds north, which is Row 001. Row 119 is at latitude 80 degrees, 1 minute and 12 seconds south. The combination of a Path number and a Row number uniquely identifies a nominal scene center. The Path number is always given first, followed by the Row number. The notation 127-043, for example, relates to Path number 127 and Row number 043. Landsats 1-3 orbital parameters cause each consecutive daily track to be shifted west 25.8 degrees of longitude at the equator, corresponding to 2872 km (1784 miles). Each succeeding day of Landsat 1-3 coverage overlapped the coverage of the preceding day. This constitutes one complete coverage cycle, consisting of 251 orbits, taking exactly 18 days and providing complete global coverage between 82 degrees north latitude and 82 degrees south latitude. The consecutive day sidelap resulted in a minimum of 14 percent at the equator to nearly 85 percent at extreme latitudes. A combination of data processing and orbital adjustment keep the error in the individual framed image centers of any geographical area on the Earth within 37 km (23 miles) in the across-track direction and 30 km (19 miles) in the along-track direction. Landsats 4, 5 and 7 have Earth coverage similar to Landsats 1-3. However, the lower altitude results in a different swathing pattern. Landsat 5 and 7 (and Landsat 4 prior to its decommissioning) operate in a repetitive, circular, sun-synchronous, near-polar orbit at a nominal altitude of 705.3 km (438.4 miles) measured at the equator. The descending orbital node time is 9:45 AM +/- 15 minutes at the equator with an orbital period of 98.9 minutes, completing 14 9/16 orbits per day and viewing the entire Earth every 16 days. Each consecutive daily track is spaced 2752 km (1709 miles or 24.7 degrees) west of the previous orbit at the equator. Each succeeding day’s track is shifted at the equator to the west 10.8 degrees of longitude corresponding to 1204 km (748 miles). Coverage sidelap of adjacent orbits for the Landsat 4 and 5 MSS sensors are a minimum of 7.3 percent at the equator to nearly 84 percent at extreme latitudes (see table below). Successive orbits and framing operations are controlled to assure no more than 18 km (11 miles) variation in the across-track direction. The Landsat 4, 5, and 7 Worldwide Reference System-2 (WRS-2) is an extension of the global Landsat 1 through 3 WRS-1 and utilizes an orderly Path/Row system in a similar fashion. There are, however, major differences in repeat cycles, coverage, swathing patterns and Path/Row designators due to the large orbital differences of Landsats 4 and 5 compared to Landsats 1 through 3. The 16-day ground coverage cycle for Landsats 4 and 5 was accomplished in 233 orbits. 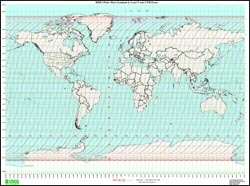 Thus, for Landsats 4 and 5, the WRS-2 system is made up of 233 paths numbered 001 to 233, east to west, with Path 001 crossing the equator at 64.60 degrees west longitude. Landsat 4, 5 and 7 scenes are chosen at 23.92-second increments of spacecraft time in both directions calculated from the equator in order to create 248 Row intervals per complete orbit. Note that this is the same as the Landsat 1 through 3 WRS-1 system. The Rows have been positioned in such a way that Row 60 coincides with the equator during the descending node on the day side part of the orbit and Row 184 during the ascending node. Row one of each Path starts at 80 degrees, 47 minutes north latitude and the numbering increases southward to a maximum latitude 81 degrees, 51 minutes south (Row 122) and then turns northward, crosses the equator (Row 184), and continues to a maximum latitude of 81 degrees, 51 minutes north (Row 246). Row 248 is located at latitude 81 degrees 22 minutes north whereupon another Path begins. For further information on the WRS, visit the Landsat 7 Science Data Users Handbook.